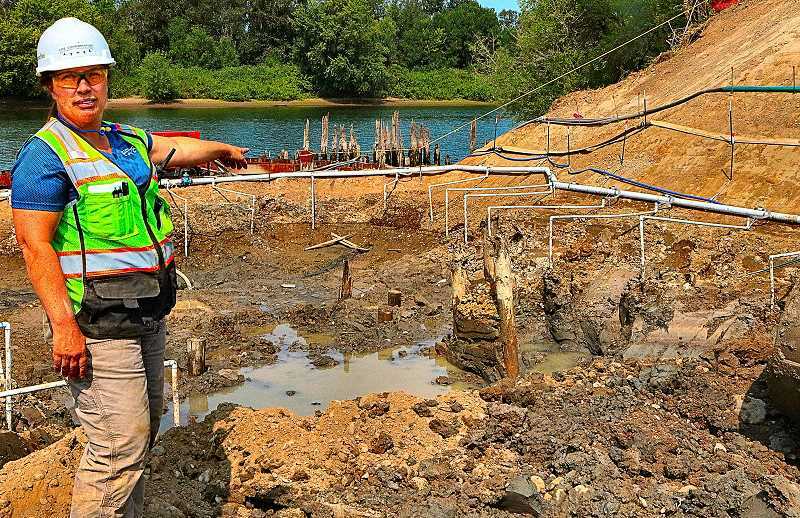 The most dramatic change is that the dike between the Oaks Bottom and the Willamette River – upon which both the Springwater Trail and the Oregon Pacific Railroad tracks rest – has now been excavated to below water level, removing about 4,000 cubic yards of rock and soil. "When it's finished, the area will flood during high water periods; and, in low-water times, the new channel we're digging – it snakes through the area – will still provide a stream flowing through here," Erion made clear. "We're working with a local company, Westlake Consultants – it's another woman-owned business – which created a computer-aided design model of the new wetland area, and we're using that digital information in our GPS-controlled excavating and contouring machines, allowing us to perfectly follow the topographical computer model!"